There is something about an opal that leaves you staring. It is one of those stones that remind you how amazing it is that precious and semi-precious gemstones are created by the natural elements of the earth. We are a little opal obsessed here at Kernowcraft. Sourcing amazing, high quality opals from all over the world is something we are quite fond of doing... and we have to say, with nearly 50 years experience in the bag, we've got pretty good at it! With so much experience we have collated a lot of information and resources all about this beautiful stone. Opals are the birthstone of October and are a perfect celebration of this pretty autumnal month. 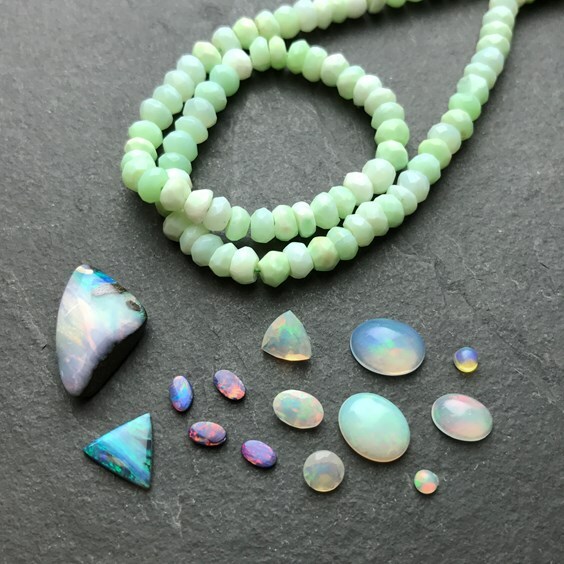 In this blog we delve into everything opal, from properties and meta-physical properties to history and formation, plus lots of jewellery making inspiration! Colour: Opal comes in array of colours from white, grey, blue, green and pinky-orange - depending on its 'group'. Rarity: So far opal is easily obtained, however, there are certain variants that are rare and whilst there is no standardised or set method for valuing opals (as each one is so unique), there are a number of elements that make a boulder opal higher quality than others for example, the play of colour, brilliance and pattern. Sourced: Australia, Mexico, Peru, United States and South America. Opal falls under two main varieties: precious opal or the 'opalescent opal' and the common (potch) opal. Their physical properties vary considerably and there are many varieties of each type. There are two groups of precious opals - those with a white or light basic colour, known as white or milky opals, and the rarer black opals - these are dark grey, dark blue or grey black - deep black is rare. Precious opal displays beautiful flashes of colour, whereas common or potch opal displays no iridescent colour and is often opaque (however it can still be very attractive). Find out more about the different types of opals on our All About Opals page. Opal is a form of silica, chemically similar to quartz but containing water within the mineral structure. Precious opal generally contains between 6 – 10% water and consists of microscopic silica spheres arranged in a regular pattern. It’s these silica spheres that determine the colour of the opal - large spheres create reds and small spheres go through the spectrum of colours with the smallest creating blues. In ancient Rome, opal symbolised love and hope. 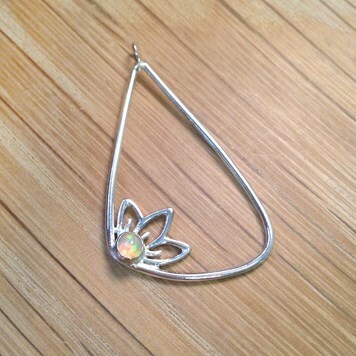 The Romans gave it a name opalus, meaning “precious stone.” Opal has been a popular, symbolic stone for many centuries. Arabic legends say it falls from the heavens in flashes of lightning. The ancient Greeks believed opals were a gift of prophecy protectect against disease. Europeans have long believed the gem is a symbol of hope, purity, and truth. Boulder opals are a very popular variety of opal and one of our favourites! We are lucky enough to personally know our boulder opal suppliers - they are a husband and wife time who mine and cut the opals themselves in Australia and come over to the UK to show jewellery designers and opal collectors. On their last visit they showed us an example of an opal in its rock form - see image below. Boulder Opals are mined from large ironstone boulders under the ground. Thin veins of colourful opal forms in the cracks. It is then carefully cut, shaped and polished. They are valued by their colour, the number of colours, size and coverage of flash (the play of colour, sparkle within the stone). The opal is known to stimulate originality and dynamic creativity, as well as aid in accessing and expressing ones true self. The Crystal Bible (by Judy Hall) explains that the Opal is absorbent and reflective - picking up thoughts and feelings, amplifying them and returning them to the source - teaching us that what you put out comes back. Opal amplifies traits and brings characteristics to the surface for transformation. Enhancing self worth and helping you to understand your full potential. Opal is believed to encourage spontaneity. It is said that the gemstone is associated with love and passion, and helps you to release your inhibitions. Opal is thought to strengthen memory and therefore help treat Parkinsons disease. It also said to fight infections and fevers. It is also said to purify the blood and kidneys as well as help to regulate insulin, ease childbirth and alleviate PMS (dark colours). Opals are a very popular gemstone for jewellery, they add a real talking point and with such a variety to choose from there are so many design possibilities. Below are a few resources including projects, blog posts with tips on setting boulder opals as well as customer jewellery examples! To view our extensive collection of opals - from cabochons, to faceted stones, beads and plenty of boulder opals click here. This gorgeous opal ring is by Jenny from Sea Surf Rocks. She has used one our free form opal doublets as the feature stone. 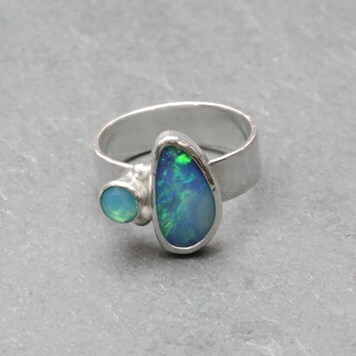 This ring features in our blog post - 10 Tips for setting boulder opals. This pendant is simple but elegant and gives you the opportunity to try out some basic silversmithing techniques. The ready-made bezel settings are great time savers and make trying stone setting much easier. 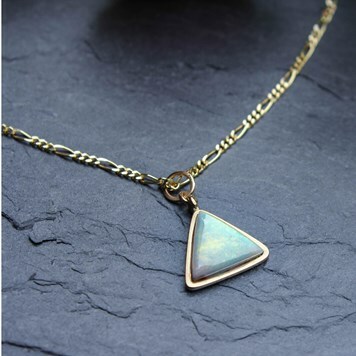 We have chosen the beautiful and flashy Ethiopian Opal Cabochons to be the feature gemstone in this pendant. Click here for step by step instructions. This stunning necklace was made by Joe Brady from Pink at Dusk. Joe has featured one of our amazing lightning ridge crystal opals triangle cabochons.